A DOCTYPE declaration must be specified on the first line of each web document: The DOCTYPE tells the web browser which version of HTML the page is written in. In this class, we will be using ‘XHTML Transitional’, which allows us a little flexibility. The <html> element tells the browser that the page will be formatted in HTML and, optionally, which world language the page content is in. The <head> element surrounds all the special “behind the scenes” elements of a web document. Most of these elements do not get displayed directly on the web page. The <body> element surrounds all the actual content (text, images, videos, links, etc.) that will be displayed on our web page. Immediately after the <head> line, we place this <meta> element: This line declares that the document is encoded in the UTF-8 (Unicode) character set. There can be multiple <meta> lines in the same web page. The <meta> element is often used to provide additional information such as page keywords, a page description, and the author(s) of a web document. 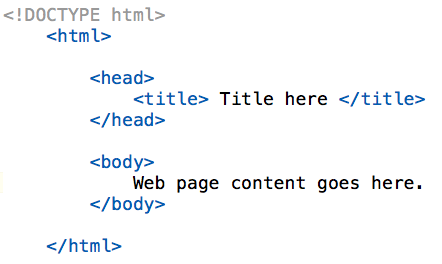 Every web document must include one and only one instance of DOCTYPE, <html>, <head>, <body>, and <title>.